...which had run in the Daily Express from 1924. Milligan claimed that the columns, with their unlikely larger-than-life characters and bizarre humour, were a major influence when he created The Goon Show for radio. 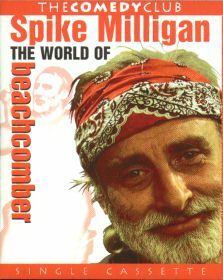 Although Milligan had less to do with the scripts here than with his other series, The World Of Beachcomber nevertheless embraced a style that was unmistakably his. The series featured monologues, odd dances, filmed sketches, spoof advertisements and strange readings, such as The Anthology Of A Huntingdonshire Cabman, read out in the early episodes by Michael Redgrave. 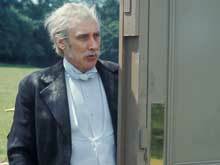 The shows, fronted and linked by Milligan as the dressing-gowned, pipe-smoking Dr Strabismus, included regular practical demonstrations of well-known phrases (eg, the contention 'When one door closes, another opens' was tested in a field full of doors) and advertisements for useless products from the Threadgold company, such as 'Threadgold's Thoroughgrip Garterettes'. As the series progressed, the items became increasingly bizarre and in between the two seasons Milligan launched his Q series which pushed still further the limits of surrealism and craziness on television, paving the way for Monty Python's Flying Circus which began in October 1969. Note. The Beachcomber humour was brought to BBC Radio 4 by Richard Ingrams, John Wells, Patricia Routledge and John Sessions in the first of several series starting 18 March 1989. BBC2 / 19x30m-e / 1968-69 Season 1: (13 episodes) 22 January - 22 April 68 / Season 2: (6 episodes) 22 September - 27 October 69 Writers: Barry Took, John Junkin, Neil Shand, Ken Hoare, Spike Milligan / Producers: Duncan Wood, John Howard Davies Sketch series starring Spike Milligan and based on the work of J. B. Morton whose Beachcomber column appeared in the Daily Express. Also appearing were Frank Thornton, Patricia Hodges, Julian Orchard, Michael Redgrave (season 1), Clive Dunn (season 1), Hattie Jacques (season 1), Lionel Wheeler (season 1), Paul McDowell (season 2), Fred Emney (season 2), Arthur Mullard (season 1) and Gerald Campion (season 1).